Enter this T-Rex adventure to climb the rocky terrain, race through the obstacle challenges and more! 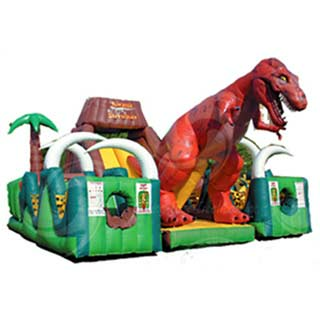 Participants enter this T-Rex theme obstacle course through an ancient dinosaur bone yard, then use ropes to climb up the rocky terrain of the volcano at the mountain’s peak, and take the fastest route to the bottom on one of the two 10-ft. high inflatable slides. There are tunnels to race through along with a few other dinosaur theme obstacle challenges. Jurassic Adventure features sound effects and a start and stop timer system for team challenges.